Both jerseys are inspired by the U.S. Navy. The Rochester Knighthawks unveiled Military Appreciation Night jerseys which will be worn by the Knighthawks and Buffalo Bandits on Saturday, Jan. 26. For the fourth straight season, the players will wear special military-themed jerseys which will be auctioned off, with the net proceeds going to Veterans Outreach Center (VOC). Both jerseys are inspired by the U.S. Navy and thank the Navy Operational Support Center of Rochester for its support and the passion they’ve shown the Knighthawks over the past five seasons. U.S. Navy Chiefs Chris Flores and Lee Begy have played instrumental roles behind the scenes in assisting the Knighthawks with Military Appreciation Night. The game is brought to you by Veterans Outreach Center and Isaac Heating & Air Conditioning. The Knighthawks’ jersey pay tribute to the USS Rochester and the U.S. Navy members who have bravely served our country. With over 30 years of service, the Oregon City-class heavy cruiser played an integral part in providing support from the sea during the Korean War and supported troops as they made their way inland. Buffalo’s jersey feature a hybrid look at the Navy’s WWII captain’s dress uniforms and an enlisted service uniform. The white stripes replace the gold on the sleeves and create a more vintage look than the present day layout. Each jersey will proudly present 537 on the front, honoring the USS The Sullivans. The guided missile destroyer was named after the five Sullivan Brothers, who were killed in action while serving on the USS Juneau around Nov. 13, 1942. 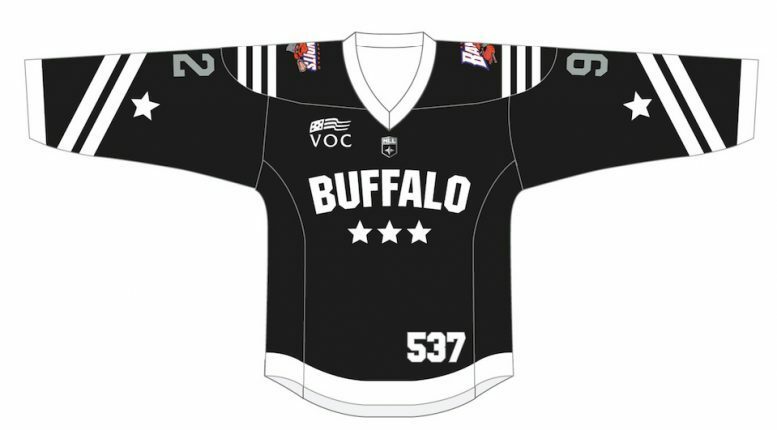 The special military-themed jerseys will be auctioned off to benefit VOC, beginning on Sunday, Jan. 20. The Knighthawks will also donate a portion of the monies from the sale of military-themed merchandise to VOC. All military members, veterans and reservists can receive one complimentary ticket at The Blue Cross Arena Office with a Military ID. Be the first to comment on "Knighthawks unveil Military Night jerseys for game with Bandits"